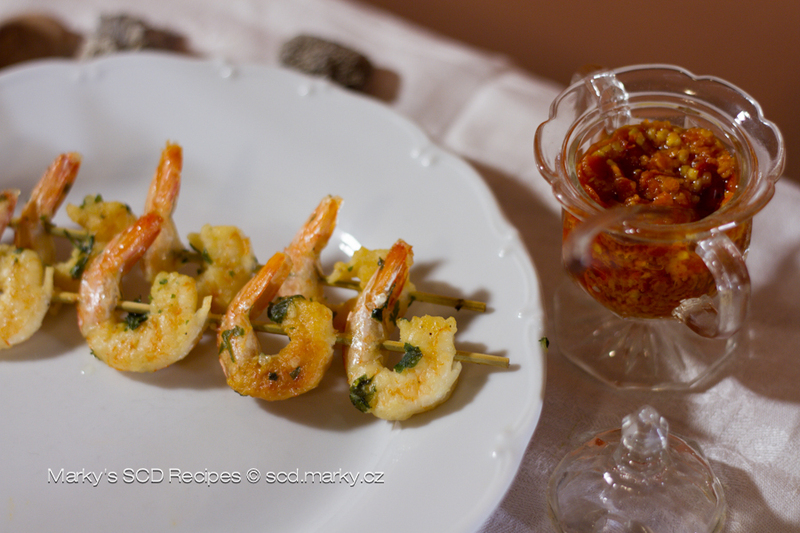 Marinated Shrimp Skewers – Heal With Meal! Shrimps as a bite sized meal? I like that! I cooked them skewered on a stick, but mostly because it's winter. Otherwise grilling would be an obvious choice. And if you happen to have an electric grill, you are in luck! I first had shrimps in this style last year, as prepared by my very good friend Sergio Belliny, an excellent chef of Italian origin, and the owner of the Brno restaurant Castellana Trattoria, who wanted to make something special for me. And I have to admit, it was quite amazing! My recipe is not directly from him, but it is also delicious! We made a deal for a future cooperation with Sergio. He will prepare recipes with meats and altered to fit the SCD. . First of all, he knows more about meat than I do, but more importantly me and Radek do not consume meat anymore. We also have videorecipes planned, so look forward to them please! Shrimps - I bought party sized, stripped with tails and preboiled (unfortunately) - it is recommended to get fish and seafood fresh, directly from fish shops, not the way I was forced to do. Wash the shrimps, dried them out and add salt and pepper. Mix all the marinade ingredients in a deep bowl (cut the herbs into soft pieces, I use olive and sunflower oil), then add in the shrimps and leave it alone for about 30 minutes. Then skewer four pieces on a stick each and put them in preheated combined oven for 10 minutes at 180 °C. If you want to grill them, it is important to wet the sticks with water beforehand. 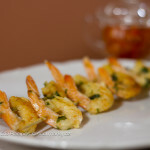 Shrimp prepared in such way - a bite sized piece, is also known as finger food, just by itself tastes perfect and it's not necessary to add anything else. maybe just decorate it. But if you still want to spice it up somehow, I recommend Italian savory mix Fuoco d´amore. It's a specialty from Calabria of southern Italy. I haven't found a recipe for it but it is possible to buy it here. Either in specialty shops with Italian products, or on the internet. 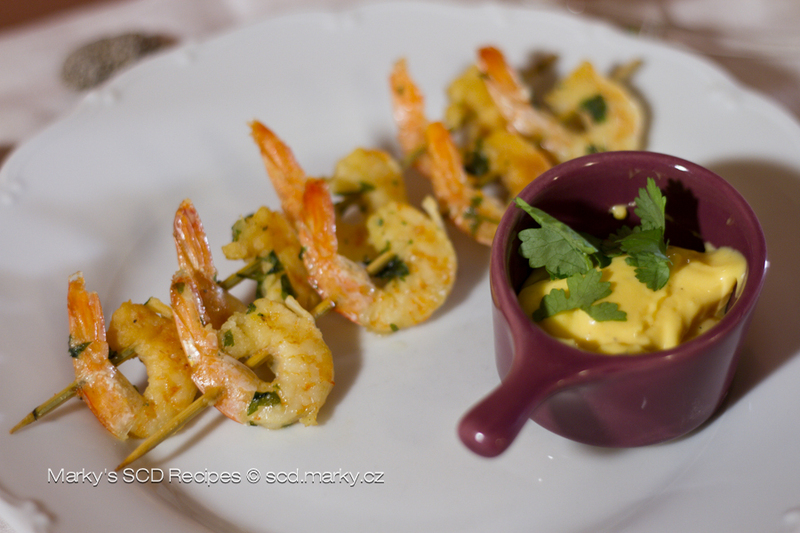 How to make a sauce from the Fuoco d´amore mix for the shrimp dip? Easy! Just 1 minute is enough! One full tablespoon of the mix is put into a bowl, add about 3 spoons of sunflower oil, 1 spoon of honey, mix it and it's done! One more important note, ingredients from which this Italian specialty is made from are perfectly fine with the SCD diet.